RHI (renewable heat incentive) is an incentive paid by the government to encourage people to install renewable forms of heating. 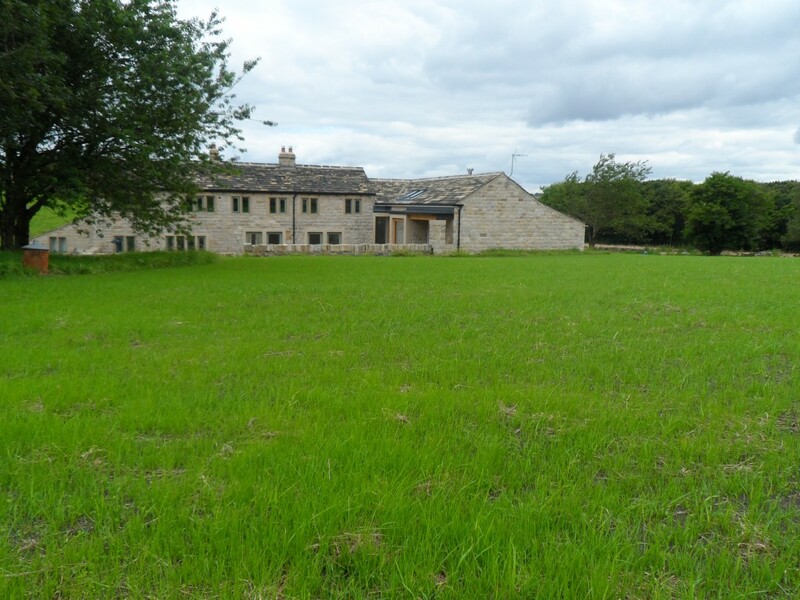 This covers ground source heat pumps (like the one that we have installed) and the incentives are intended to enable users to recoup the upfront investment involved in installing the systems. The incentives are calculated on a 7 year repayment period. RHI is covered in depth elsewhere on this blog, but today we managed to submit our application. The process is all online and administered by Ofgem. You will need to have your MCS registration number (your installer should provide you with this), your EPC reference number and your GDA (Green Deal Assessment) number. Other than that, you just have to answer a few simple questions. It didn’t take more than 30 minutes to fill in the online form. Now it is just a matter of waiting for the application to be reviewed. Although the application process opened in April, it has taken us a few weeks to sort out the EPC. The RHI payments are based on the heating requirements calculated as part of the EPC. I haven’t really paid that much attention to EPCs before (you need one if buying or selling a house), but when a payment depends on it, it gets a lot more attention. We had a problem that the first couple of EPCs that were done bore little resemblance to the original calculations before by the system installer. The original estimates were that the annual heating and hot water demand would be in the region of 50,000kWh. The first two EPCs were in the region of 30,000kWh. The current RHI payment is 18.9p for every kWh generated, so a 20,000kWh difference equates to around £3,780 per year, or £26,460 over the 7 year payback period! 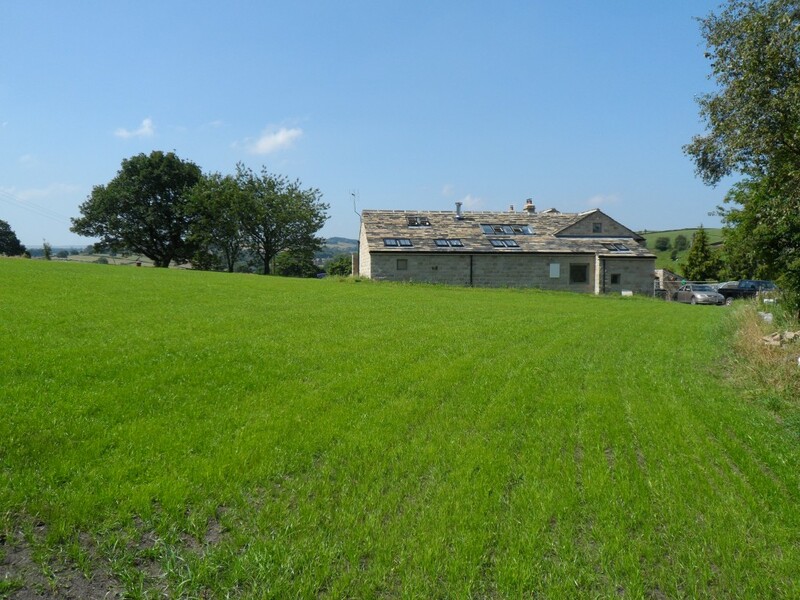 The main problem with the first two EPCs seem to be the unique nature of our property – some areas are double height, some parts of internal insulation on the original solid stone walls, even the heat pump itself seem to cause some head scratching. The first assessor failed to produce an EPC at all! He did the initial visit, asked lots of questions and then we never heard from him again. The second assessor did his best, but our property didn’t neatly fall into many of the boxes that needed to be ticked. Eventually, on the third attempt, we got an EPC assessment that was close to the original heat calculations. The annual heat demand is still below the original calculations, but it is close enough. The RHI application was submitted this morning and with any luck we should hear in the next week or so. Well, it has been almost a month to the day that we sowed the grass seed in the top field. Today’s the day to get the lawn mower out. According to most of the gardening books, as soon as the grass gets to about 3 inches long, you should cut it taking just about 30% off. This works well with our lawn mower on the highest setting. It took a good couple of hours to cut the grass. 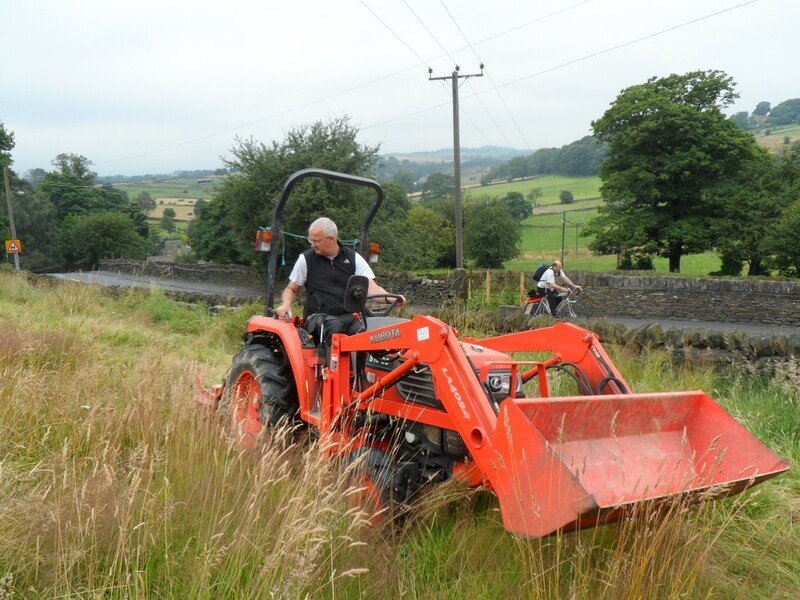 The lawn mower is only small and although the field is largely flat, there is still around an acre to be cut. Today, the temperature is around 28C, so it is hot work pushing a lawn mower around. I can’t helping feeling that a push along lawn mower is not the right tool for the job! But it is the only one we have. Ideally, we could now do with some rain, but I think we are going to have to wait until Sunday for any rain. We have just run the lawn mower over the new grass. It was about 3 inches long and we just took the top inch off. It was sown 4 weeks ago to the day. The grass is starting to thicken out. We are not short of sunshine at the moment, but a drop of rain would be handy. There is some forecast for the weekend. 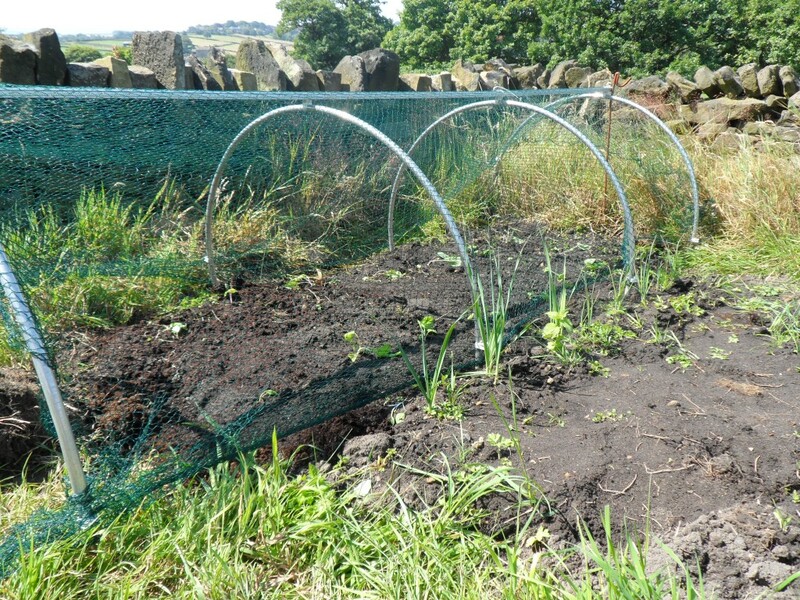 And this time, I have planted the cabbages under some netting. The last lot of cabbages (and broccoli, for that matter) were eaten by the wood pigeons. They made quick work of polishing off a dozen cabbage plants and about the same amount of broccoli. We have planted these cabbages where the early potatoes were planted. We have harvested these and are now onto the main crop of potatoes. 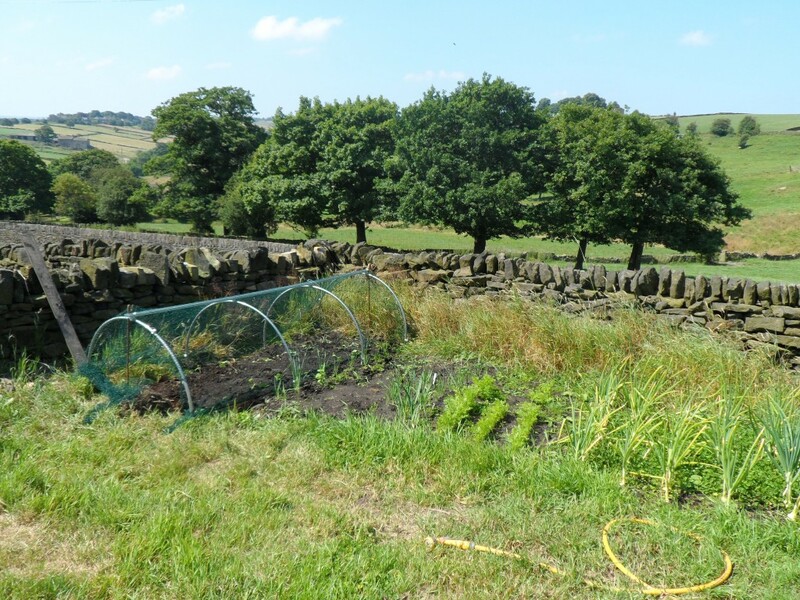 We have also planted more leeks and sown some carrots. We have just about finished all of the carrots that we grew earlier in the year in the polytunnel. The onions seem to be doing well, but not as well as the weeds! This time we are going to try growing cabbages under netting. The pigeons ate all of the summer cabbages. Last year, the cabbage fly ate most of the cabbages in the polytunnel (which was the wrong place for them anyway). Hopefully, we will have a bit more success with these. 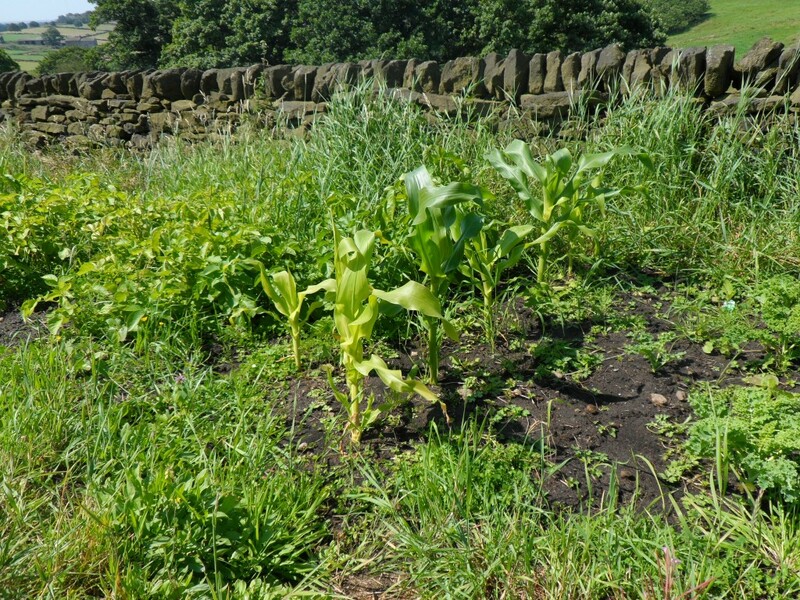 In there, amongst the weeds, are 6 sweet corn plants. We would have had more, but for some reason I had problems getting the seeds to germinate. Goodness, whether these will flower, but we shall see. The grass in the bottom field as reached waist height and we really should have cut it before now. With rain forecast for this weekend, it seems the right time for us to cut it. 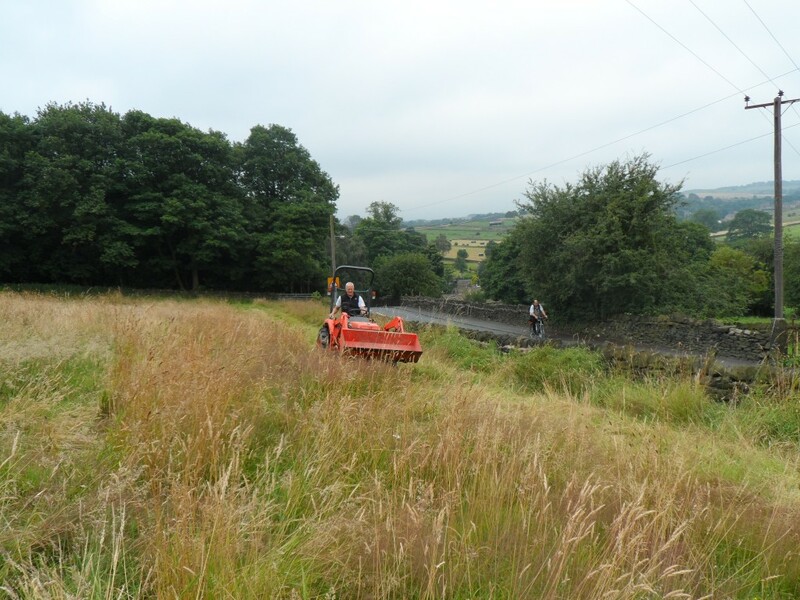 We borrow a tractor and grass topper from a neighbour in the village which makes quick work of cutting the grass. We do have to make two passes though as the grass is so long. 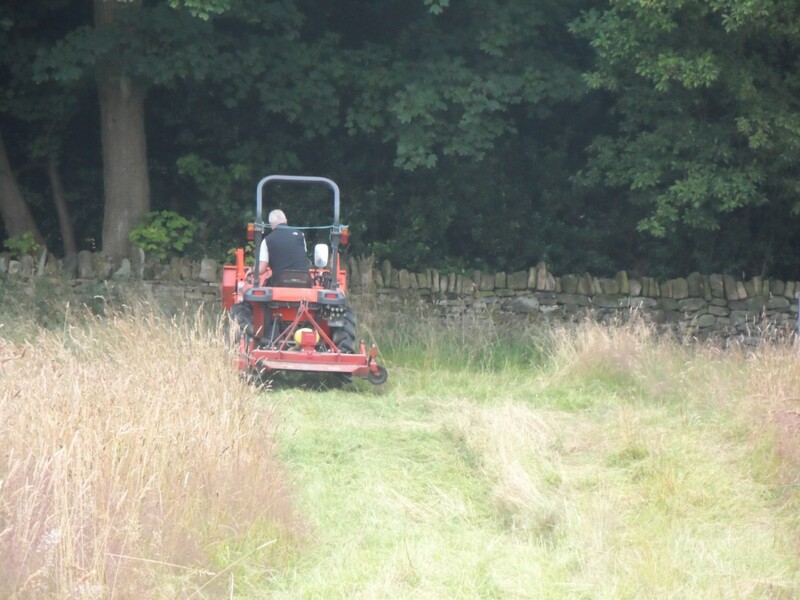 The slope on the bottom field also means that you need to mow up and down the slope (and definitely not sideways) otherwise there is a risk that the tractor might topple over. A couple of hours work and the job is done! We really should have cut this grass before now. We really have let it get a bit long. It is up to waist height. There is nothing else for it, but to get the tractor and topper out! The grass was so long that we had to cut it twice. This just made the task twice as long! Still it looked much better once done. The guy riding the bike in the background has two paddles strapped to the top bar of his bike. He cycled back a little later, but this time he had only one paddle strapped to his bike. What happened to the other paddle? This always looks like good fun when someone else is doing it, but it isn’t really. There is too much of a slope on this field (although you can’t see it in these shots) and it feels as if the tractor is going to topple over. 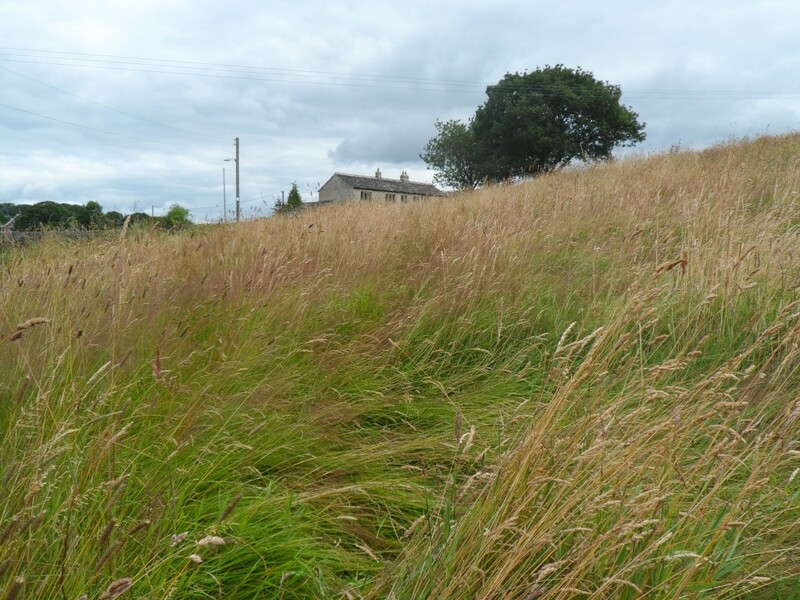 You can avoid this to a certain extent by mowing up and down the slope, but it still has its moments! It has been two and a half weeks since we sowed the new grass in the top field. It seems to becoming on in leaps and bounds. No doubt the mixture of sunshine and showers recently has helped! We seem to be costly picking up stones that are coming to the surface, as well as old clumps of dried out grass, but it is looking better by the day. From what I can tell on the internet, the grass should be cut for the first time once it reaches 7.5cms and then it should only be cut to remove no more than 30%. The grass should be watered straight after. I think the grass is only around 5cms, so we are going to leaving it for a couple of weeks and then cut it just before it rains. Hopefully this will increase the growth even further. 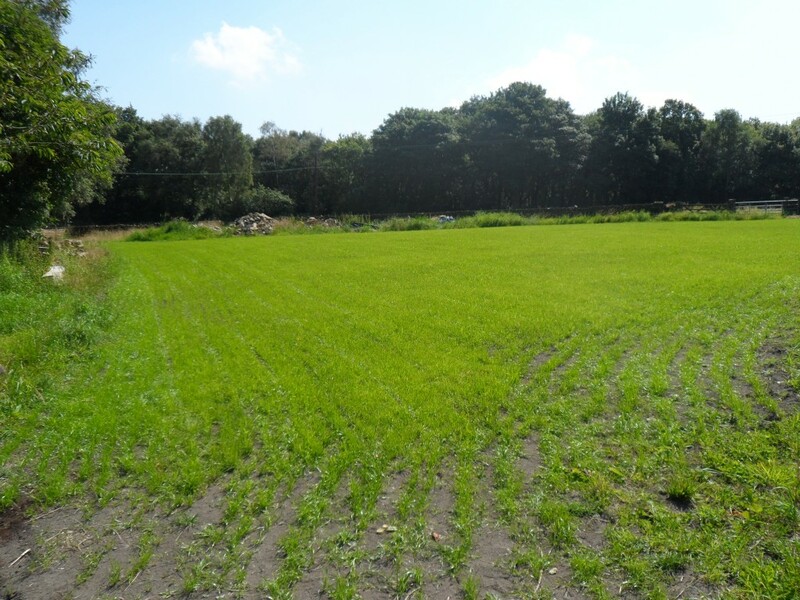 Sunshine and showers are great for growing grass! It really does look green in these photos! It has taken 2.5 weeks to get to this stage. 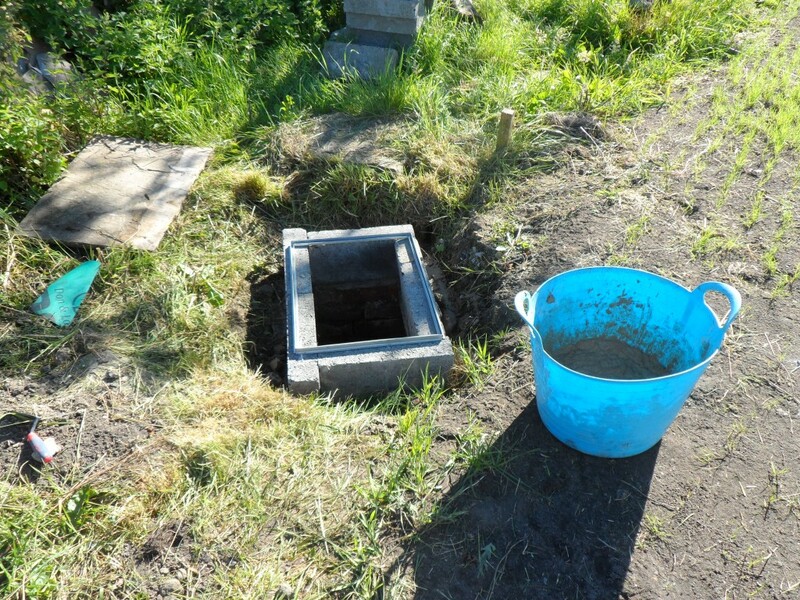 When we bought the property, there seemed to be a lot of manholes around the place that didn’t have proper covers. The covers were either old bits of plywood or large slabs of stone. 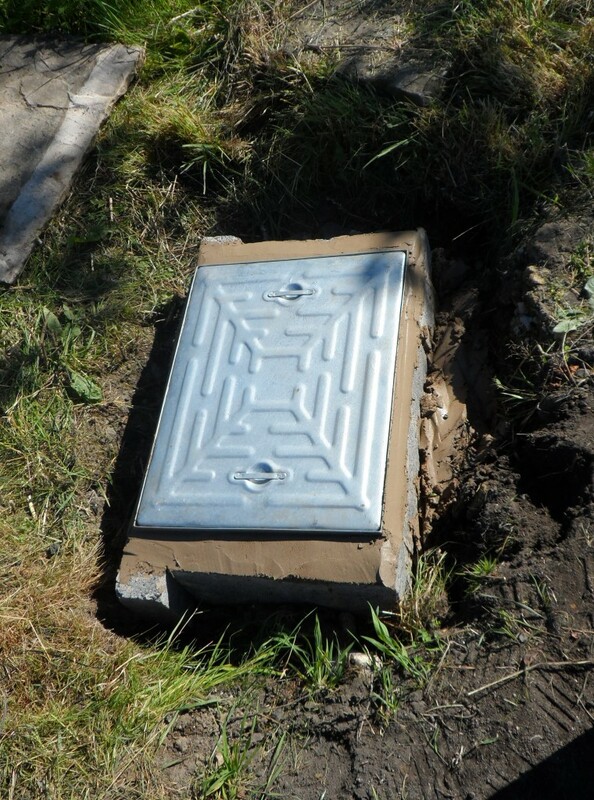 The rotten plywood covers (mainly on the septic tank) have been replaced with proper cast iron covers. This left us with one manhole in the top field that covered the access to the soakaway. We have no idea how old this soakway is, but when we tested it (by scientifically throwing about 40 gallons of water down it), it seemed to work. Rather than digging a new one, it made sense to reuse it and the rainwater from three drainpipes on the new extension flow into this soakaway. This was originally covered by a large slab of stone and was covered by soil. We found it when we were digging the foundations for the extension. 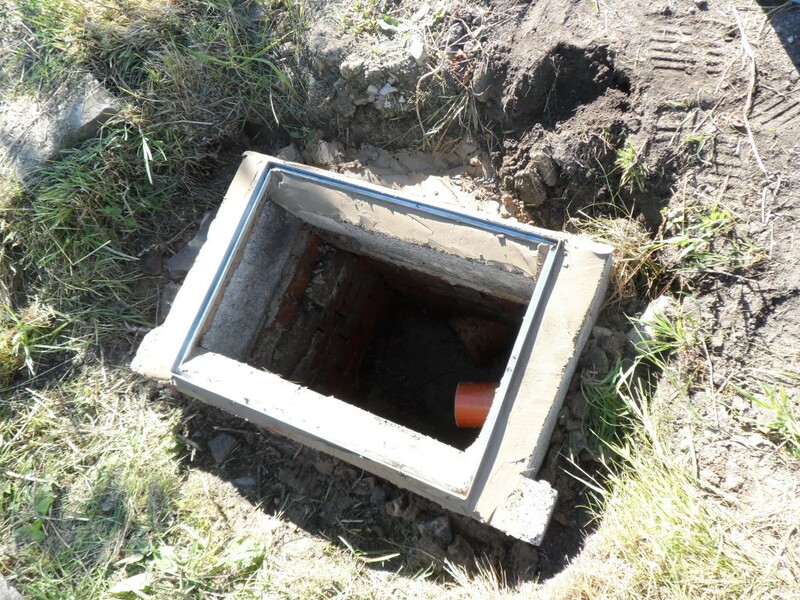 We have had to lift the height of the manhole so that the new cover is at ground level. This entailed an extra row of concrete blocks on edge. Then we were ready for the new manhole cover (and frame). This was cemented in and once it has all set, we will back-fill around the edge to bring it up to ground level. The new frame in place. These seem to come in a number of different sizes, but never the right ones! This was the nearest fit. Next job is to cement the frame into place. Frame now cemented in place. It won’t take long for it to go off on a day like today. The frame has been cemented in place and the lid put on. As soon as this is all set, we will fill in the area around the manhole and reseed it. About 5pm today, a white Citroen car pulled up alongside the wall that runs along our orchard and threw a dog over the wall. I couldn’t have been more than 20 feet away on the other side of the wall when it happened, but I wasn’t quick enough to catch the car registration number. It took me a minute or so to work out what was going on and the view of the car was obscured by the trees. We tried to catch the small white terrier, but unfortunately it escaped in to next door’s field. Trying to find a dog with short legs in a field of long grass is rather like looking for a needle in a haystack! It did reappear and we did try and catch it again, but to no avail. We did, however, meet one of our neighbours from the next door farm. We alerted the police to the event, but there isn’t much that can be done. It is amazing how scummy some people are! Hopefully, the dog is still out there somewhere. 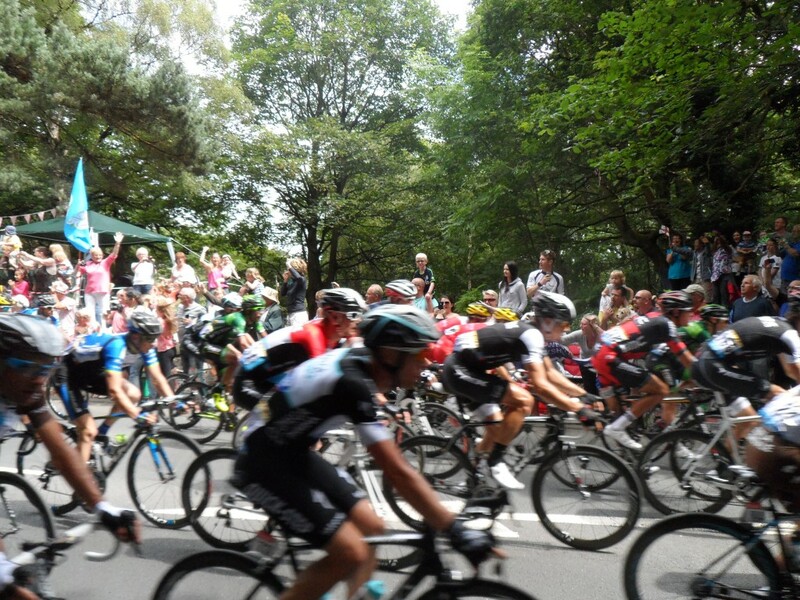 The Tour de France sped through Holmfirth – and about 200m from the house – over the weekend. No one really knew what to expect, but the atmosphere and the event was somewhat surreal. Everyone seem to enter into the spirit of the event and the atmosphere was amazing. We stood on the side of the road on the way into Holmfirth. We got there about 2 hours before the main event, but even then the roadsides were starting to get busy. With an hour before the cyclists were due to arrive, the “caravan” of vehicles sped through in advance – many of them promotional vehicles, others police cars and motorcyclists. It seemed to be more than enough to keep the crowds entertained and before we knew it, the cyclists (all 200 of them) had come and gone. This is the Huddersfield road on the approach to Holmfirth. 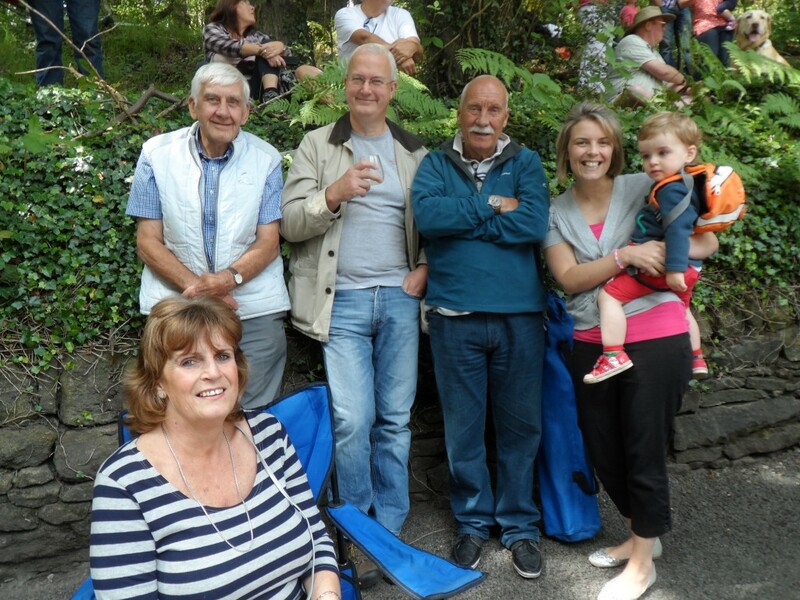 The roadsides were busy with spectators a couple of hours before the cyclists arrived. The atmosphere was amazing! Now it might look like I am the only one with a drink, but the others had already finished theirs! Honest. 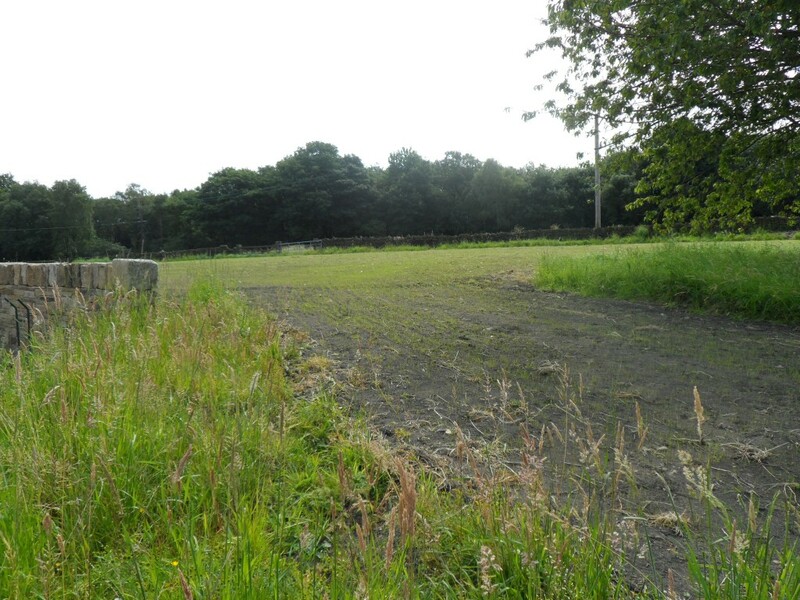 The “green haze” has started to appear on the top field about a week after the grass seed was sown. While it has been dry for the last few days, rain is forecast in the next 24 hours. This is a bit of a shame for the Tour de France, but it is going to help the grass! This is the view into the top field. While you can see the old grass to the right and left, the new grass has started to appear about a week after being sown. It seems to be growing daily!